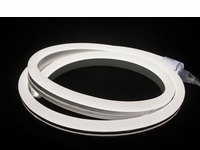 Our LED neon flex comes in a few different styles that are best suited for different types of projects. 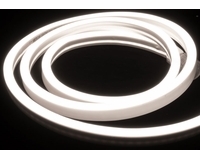 Polar 2 LED Neon Flex: This is the standard-bearer of LED neon. Measuring 5/8"W x 1-1/8"H, it comes in eight solid color options and is best used for architectural outlining and building perimeter accent lighting, where you have mostly straight runs and a few bends. Polar 2 Mini LED Neon Flex: Measuring 7/16"W x 3/4"H and coming in the same eight solid colors, this version is dramatically smaller than the full-size Polar 2 neon. As a result, it is much more pliable and easier to bend, making it ideal for signage and complex designs with lots of bending. 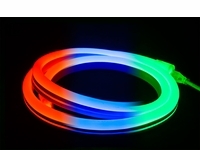 RGB LED Neon Flex: Measuring the same size as the Polar 2 neon (5/8"W x 1-1/8"H), this low voltage neon has 3-in-1 5050 SMD LEDs that allow you to utilize multi-color and color-changing effects in your neon designs. It can easily be controlled by an RGB or DMX controller.